No generation can help itself from commenting on how the problems of their era starkly differ from those of other generations. In no other area are these distinctions more easily demonstrated than in entertainment. But occasionally, a piece of film or music articulates issues that transcend generation and provide a commentary that forces everyone to realize how history repeats itself. 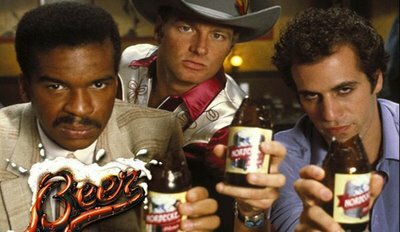 In 1985, director Patrick Kelly’s Beer is one such film. Beer satirically indicts the world of advertising. Poking fun at all levels of the commercial marketing process, Kelly takes on everything from board meetings and creative concept execution to public response to an ad campaign. The film focuses on the people responsible for the promotion of Norbecker Beer, a German brand looking to make a dent in the market share against Budweiser and other popular brands. Led by ad agency exec B. D. Tucker (Mash‘s Loretta Swit), the beer company capitalizes on the newfound celebrity of 3 everymen, whose role in foiling a maniac’s killing spree turns them into overnight heroes. These guys think your ice cold silver bullet train is bulls#!t. In today’s comedy, confronting the absurdity of how race, gender, and sexuality play out in society is customary, bordering on old hat among smarter audiences. Beer proves that now common depictions of social paradigms is due to bold depictions from the past. For instance, one scene in the movie exposes the trend of white people deciding what commercially acceptable blackness is. In the scene, B. D. and Elliott (then up-and-coming actor/comedian David Alan Grier) discuss how his image as a lawyer and family man may not resonate with the viewing public. The measures he takes to satisfy the ad executives manifest as the kind of absurdity only daring satire can exhibit. Although the ‘black enough’ trope continues to thrive in real life (ask the President), only comedy can properly articulate how ridiculous it is. Beer has many other smart and funny moments that convey the paradox of how human exploitation in business prevails in spite of the human spirit’s ability to recover from it. And the serious moments of the film solidify that same moral. So for fans of movies that examine the ugly subculture of mainstream business, Beer is a great find. It is the brand of satire that Mark Twain would applaud. And besides, how can you pass up the fictitious foreshadowing of Rip Torn’s now very public alcoholism?